Leave a comment March 28, 2019 Rachael A. World War II proved an age of female empowerment on the home–front, as women kept the world running by stepping up to fill both jobs and societal roles traditionally held by men while the men were off at war. The same principle held true for education, and ISU (Iowa State College at the time) was not the only co-ed college in the country where female students temporarily outnumbered their male counterparts. The majority of these women still veered towards liberal arts and home economics majors, but a large number also waded into the hard sciences. Many of them discovered that they possessed an untapped talent for STEM research. Below are a handful of examples. 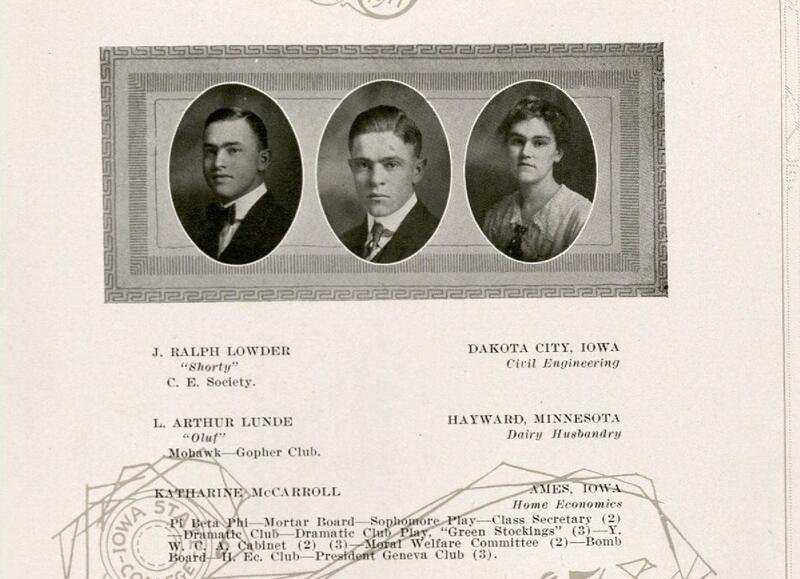 Beatrice Bruner Dowd (1924-1998), a native of Rolfe, Iowa, graduated from Iowa State College with her B.S. in Mathematics in 1941. She was very active in clubs and societies, and she also saved a great deal of correspondence from her time in school, where it appears she was well-loved and had many friends. Letter from a college friend. RS 21/7/117 Box 5, Folder 7. Such letters are always interesting to peruse, because they reveal glimpses of life on campus at the time, above and beyond the education and career of the individual. Price changes in particular catch my attention. For example, did you know that Beatrice paid only a $5.00 deposit on her dorm room in 1940? With inflation taken into account, that’s about $90 in today’s currency. And one of her friends wrote that she was worried about having already spent $0.20 (equivalent to about $3.60 today) at the Union for her meals that morning – that it was so difficult to keep one’s daily expenses under $0.60 (about $10.80 today). Room Deposit Slip. RS 21/7/117 Box 5, Folder 7. It is unclear who, if anyone, might have encouraged Beatrice to pursue mathematics, but her college friends’ letters reference her aptitude in STEM subjects, particularly physics, several times. In 1943, after graduation, Beatrice joined the Navy, whereupon she was assigned to study meteorology at the University of California at Los Angeles so she could work as a Naval Weather Forecaster. Her papers contain her notes (and some doodles) from various courses she took at UCLA. Beatrice’s notes from a course on tropical meteorology. RS 21/7/117 Box 3, Folder 15. It is unclear why Dowd saved this amusing doodle on her weather maps from school, or whether she or a friend drew it. But it is certainly unique. RS 21/7/117 Box 3, Folder 15. Her papers also include procedural documents and training materials from the Navy. Some of these employ humor as a memory aid, as is the case with the cartoons below. Researchers who would like to peruse the full collection of training cartoons, however, should be aware that some of these contain racist depictions of Japanese military personnel. United States Naval Training Division’s Humorous Training Cards and Famous Last Lines. RS 21/7/117 Box 3, Folder 16. After the war, Beatrice worked for a company called Sylvania Electronic Products (later known as GTE Government Systems), where she eventually became the Engineering Department Manager before retiring in 1986. Curiously, she also belonged to a group known as the Association of Old Crows (AOC), begun in the 1960s by veterans who had worked as Electronic Countermeasures (ECM) officers in World War II, disrupting enemy communications and radars. The group exists to this day, creating symposiums and journals to educate the public about electronic warfare. Association of Old Crows Certificate. RS 21/7/117 Box 8. Hilda S. White (1953-1997) received her Ph.D. from Iowa State after earning her bachelors in Chemistry from Bethany College, West Virginia, in 1942. Excerpt from an autobiographical note by Hilda S. White. RS 21/7/109 Box 1, Folder 2. While a grad student at Iowa State, she met her future husband, Phil White, who went on to earn his D.Sc. at Harvard, where both he and Hilda were employed as biochemists in the Department of Food and Nutrition for about two years. Immediately following this, Phil’s program at Harvard sent him to Lima, Peru to perform analysis on food consumption in that country, and Hilda accompanied him. It is unclear precisely what her role in the expedition was, as even her own subsequent write-up of the trip centers around her husband’s job and paints her own experience primarily as that of a housewife, referencing the birth of her first child (which would undoubtedly have consumed much of her time!). Excerpt from a report on her time in Peru. RS 21/7/109 Box 1, Folder 1. But she was also, it seems, performing research connected to the project simultaneously, publishing papers in professional journals, and receiving her own salary from Harvard. Research published during Phil and Hilda’s time in Peru. RS 21/7/109 Box 1, Folder 1. When they returned home in 1953, Phil joined the staff of the American Medical Association in Chicago. The chair of the organization was in the process of looking for a qualified candidate to teach Nutrition at the Home Economics department for Northwestern University at the time, and Phil recommended Hilda, who got the job. She taught there until 1973, when the department dissolved. While at Northwestern, Hilda continued to perform and publish research, this time on “Inorganic Elements in Weighed Diets of Girls and Young Women” and “Utilization of Inorganic Elements by Young Women Eating Iron-Fortified Foods.” She eventually went on to work at the Chicago Nutrition Association and the journal board of the American Dietetic Association. Excerpt from Hilda S. White’s published research. RS 21/7/109 Box 1, Folder 1. Although her the status of her work was so frequently downplayed in favor of her husband’s, it is clear that she made major contributions to her field in her own right. Undergraduate Senior Portrait of Darleane Christian. Bomb Yearbook 1948, pg. 24. Darleane C. Hoffman (1947-2011), nuclear chemist, might be the most well-known of the alumni featured in this post. She received both of her degrees from ISU: a B.S. in Chemistry in 1948 and a Ph.D. in Physical (Nuclear) Chemistry in 1951. Her biographical web page for the Women in Technology Hall of Fame (WITI), into which she was inducted in 2000, notes that she had not originally intended to study science at all. She had arrived at Iowa State intending to pursue a career as a commercial artist. However, according to the write-up, the influence of an unnamed female professor in one of her freshman courses peaked her interest in STEM fields, and she decided to switch her focus to chemistry. Darleane’s notes from Chemistry 512 – Advanced Quantitiative Analysis, a class she took in the Spring of 1949. RS 21/7/100 Box 13, Folder 3. After graduating with a specialization in nuclear and radiochemistry (interests which would later make her famous), she applied for a job with the radiochemistry group at the Los Alamos National Laboratory only to be told, “We don’t hire women in that division.” Perhaps simply to prove she could, she continued applying to this institute until she landed a position in their Isotope and Nuclear Chemistry division, where she quickly took on leadership roles and worked for 30 years. During this period of her life, in the 1960s, she also raised two children and would reportedly return to work each night after putting the children to bed. In the 1970s, while serving as the Division Leader for the Isotope and Nuclear Chemistry division, Darleane discovered a naturally-occurring form of an element called plutonium-244, which scientists had previously believed to be a manufactured substance that existed only in laboratories. Her group also performed the world’s first aqueous chemistry on hathnium, element 105, around this time. And these discoveries led to even more innovation once she had accepted a professorship at University of California Berkeley’s Department of Chemistry. In collaboration with European scientists, the groups she led at UCLA discovered the first super-heavy elements, 118, 116, and 114. These became the focal point of her studies in later years. Among other honors, Darleane received the University of California Berkeley Citation of Merit in 1996, the President’s National Medal of Science in 1997, and the Priestley Medal (the highest honor conferred by the American Chemical Society) in 2000. Ephemera surrounding Hoffman’s reception of the National Medal of Science in 1997. RS 21/7/100 Box 17, Folder 8. We are immensely proud of these alumni here at ISU, and we hope their stories will inspire current students. If you would like to learn more about any of these scientists, feel free to visit the archives and browse through their papers. Poster. RS 21/7/100 Box 1, Folder 1. Leave a comment October 15, 2018 Rachael A. The following post was written by Amanda Larsen, who is working at SCUA this year as an Undergraduate Research Assistant (URA). Her project revolves around historical feminist activism on the ISU campus. Regarding today’s article, note that the Monday after next, exactly two weeks from today, will mark 43 years since the “Alice Doesn’t Day” strike. October 29th, 1975 was one of the first days to show the nation how much women contribute to society. The National Organization for Women (NOW) created a national strike day for women in order to emphasize how important women are for society. They called it “Alice Doesn’t Day,” a reference to the 1974 film Alice Doesn’t Live Here Anymore. NOW called for every woman to refrain from work or spending any money. The alternative for women who could not skip work was to wear an armband and discuss its purpose. On campus, the Government of the Student Body (GSB) was asked to support the strike by on campus women’s organization. The bill to support Alice Doesn’t Day was sponsored by Roxanne Ryan, a student in sciences and humanities. Roxanne Ryan with members of her residence hall. Image from the Bomb 1975, pg. 308. Not everyone supported Alice Doesn’t Day. The Iowa State Daily’s “Point of View” section notes that some believed calling for women not to go to work was not the best tactic for showing women’s roles in society. While it might have shown how much women contribute, it could also have shown unprofessionalism and little regard for their work. Others felt that women should double their efforts on the 29th with the same goal of showing how much they can contribute to society. A group opposed to Alice Doesn’t Day vowed to wear pink dresses and call for the firing of any woman protesting. In terms of students, most told the Daily that the reason they could not participate in the strike was that they had classes and “school is more important than my ethical views.” Since they could not miss classes, many of the women interviewed said they would refrain from spending money that day. Cartoon on ISU student activism (or lack thereof). The Bomb 1975, pg. 504. Rosl Gowdey, one of the publicity workers for the project, stated that the goal of the day was to “focus on what happens to the women who participate, than on the number of participants. If only one or two women get something out of it, then that’s great, and we’ve accomplished our purpose.” While most think that the day was a failure, others viewed the event as successful because of the awareness: “In terms of awareness and talking about women’s contributions, it was successful,” said by Susan Newcomer, the president of the Ames chapter of the National Organization for Women. If you or anyone you know has any information about women activist from 1960-1979 here at Iowa State, please feel free to contact Special Collections to discuss preserving the material. Image from page 19 of the Ames Daily Tribune, October 25th, 1975. Leave a comment September 24, 2018 Rachael A. Did you know there used to be an Hispanic American Student Union (HASU) on campus? Did you know that the group (for, indeed, it was a student group, not a building) was around for at least a full decade? And that it hosted a high-profile, multi-day, annual symposium with funding from the Government of the Student Body (GSB) for at least seven years in a row? And that this symposium created a unique space for American students with Hispanic/Latinx heritage to celebrate and share their culture, create dialog around social issues, converse with prominent activists, and voice to their own experiences? You didn’t? Don’t feel bad: neither did I. Neither did any of the SCUA staff, in fact, until a few days ago. This is because scarcely a whisper of such a group exists in our archives. We have no collections of meeting minutes from HASU secretaries, no photographs, no write-ups in the yearbook (a staple in research on ISU student life). Virtually nothing. So how did I find out about it? Well, I stumbled by chance across an article, not in a campus publication, but in the public library’s digitized copies of the local Ames Tribune while trying to answer a reference question. I think it was the detailed nature of the article that peaked my interest, the inclusion of the full schedule for the benefit of community members wishing to attend. How could something like this have slipped so completely under our radar? Especially when none of the archivists had even heard of HASU, and it did not appear in any of our indexes or subject guides. With an exact date to go off of, the University Archivist managed to track down a recording of the lecture delivered by Arnaldo Torres. But this turned out to be less helpful than we’d hoped, as the lecture is recorded in an older tape format and has not yet been digitized. So my curiosity remained unsatisfied. I am particularly interested in the past and present (aka “future history”!) of student organizations on campus, and I know that this kind of detective work — the business of hunting down ghosts — while frustrating, can also be really fun. So I decided I was going to learn something about this mystery organization. As a side note, I didn’t carry the investigation very far, as I was really only hunting for blog post stories. But I wanted to share some of my methodology in this post so that any of you readers who find yourselves interested in this, or similarly under-documented histories, can replicate the steps and make your own discoveries. Since I found the group in a news article, I decided to move my search to newspapers. Fortunately, my first stop, the Iowa State Daily, produced results. One is not always so lucky. Unfortunately, the Iowa State Daily back issues are not digitized or keyword searchable prior to the 1990s. This means, in order to find anything, you have to scroll through miles of microfilm. And the microfilm is not housed in SCUA (on the 4th floor of Parks), either. It’s housed in the Media Center which is located (yes, you guessed it) in the basement of Parks. Naturally. For those of you who have never used a microfilm reader before, this should give you an idea. Microfilm reader in the Parks Library Media Center. Look at all the gears and gadgets! Essentially, then, a microfilm reader is a cross between a giant sewing machine, a film projector, a microscope, and a really old, bulky desktop computer. If that sounds off-putting to you, don’t worry: the staff at the desk are all trained to help, and you get the hang of it pretty quickly. The real draw-back to microfilm, though is that, while it’s easy to find articles by date, it’s less easy to search for them by subject matter. For a limited date-range, though, the archives does have a printed subject index for Iowa State Daily articles, and this helped me out a ton. Iowa State Daily Index 1986-1987, Call #PARKS Spec Coll: Archives AI21 I8x. So, using the index, and then searching the dates it gave me on microfilm, I found a few articles pertaining either to HASU or to their annual Hispanic Symposium in Daily issues from 1985, 1987, and 1990. And because the first mention of the symposium billed it as the “fifth annual” event, I could tell right away that HASU had existed and been active from at least 1981-1990. As to whether it continued beyond that, who can say? However, if I had decided to continue my research beyond this point, the date range would have provided an important clue. Anyway, here are some of the articles I found on HASU and their annual Hispanic Symposium. I hope you enjoy them, and I hope they inspire you to do your own archival research. You never know what you will find with a little persistence. And please, if you are an alumnus, and you remember participating in HASU in the 1980s, do get in touch with me. We’ll do what we can to help you tell the story of your group more fully for the benefit of future researchers. Leave a comment September 14, 2018 Rachael A. This year, two talented upperclassmen have joined SCUA through the Undergraduate Research Assistantship (URA) program to help us uncover some of the “hidden histories” of ISU through research into underrepresented communities in the university’s past. They are working on digital exhibits that will serve as a resource for future scholars, and both URA students will be writing blog posts throughout the school year to update you on their discoveries. Today, it is my pleasure to introduce the work of Amanda Larsen, who has chosen to research feminist activism at ISU. When thinking of the early days of campus life, it is easy to distance ourselves from those who were here at the turn of the century. Women on campus had to live in dorms with few exceptions, endure strict curfew rules, and were not allowed to leave the city without special permission. Despite the restrictions to their campus life, women on campus decided to take part in gaining the right to vote. So, they created the suffrage club. On April 14th, 1916, the newly created suffrage club met for the first time. Around 150 women showed up to vote Ava Johnson as the president, Jeanette Knapp as the secretary, and Katherine McCarrell as treasurer. During the meeting, Dean Katharine McKay and those listed above spoke to the crowd. They goal of the club “was stated to be the support of the suffrage movement in Iowa with particular emphasis on the securing of pledges of votes favoring the suffrage measure to be submitted to the voters of the state in the June election.” One of the first speakers brought in by the “suffrage boosters” was Mrs. Carrie Chapman Catt, president of the American Woman Suffrage association and former student of Iowa State, for a highly anticipated lecture at the university. Despite having 150 women at the first meeting, there is little mention of this suffrage club in the archives and no mentions of it in the Bomb (the yearbook). Ava Johnson, who was the president of the club graduated in 1916, but the suffrage club was not listed within her group involvement. Nor is the club mentioned when Jeanette Knapp or Katharine McCarrell are listed the following year. Knapp is on the far left. 1917 Bomb, page 108. McCarrell is on the far right. 1917 Bomb, p. 110. Katharine’s name has been spelled “Katherine” when mentioned elsewhere. This was not the only suffrage club in Ames, but it is only one created by students at Iowa State. 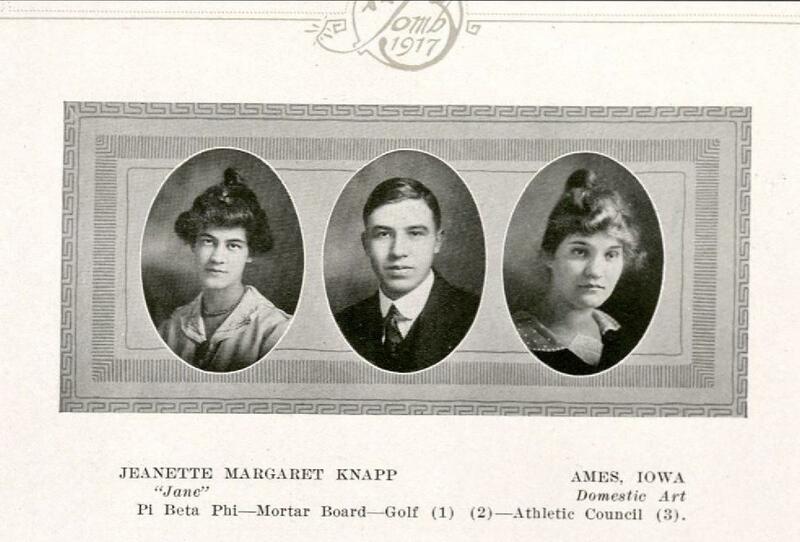 All the clubs in Ames, including the suffrage club, were focused on securing the votes for suffrage during the June 1916 election. The results of the vote were 2671 votes in favor of suffrage in Story County, while only 1606 voted against. From the SCUA Artifact Collection. 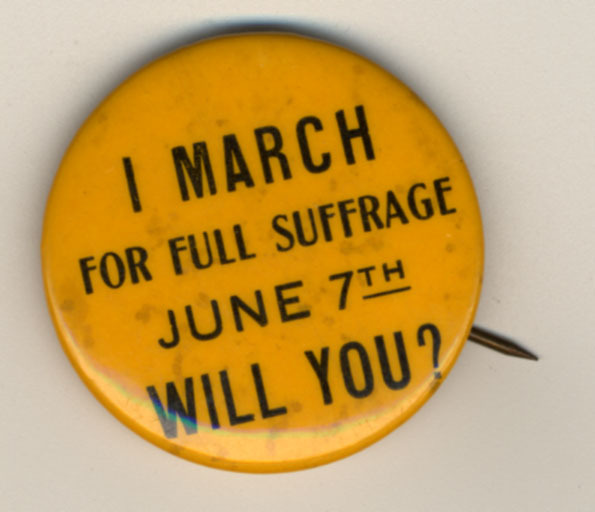 Suffragists wore buttons like this for a variety of reasons. Many to get people to know that suffrage was on the ballot or to proudly show that they were a suffragist. 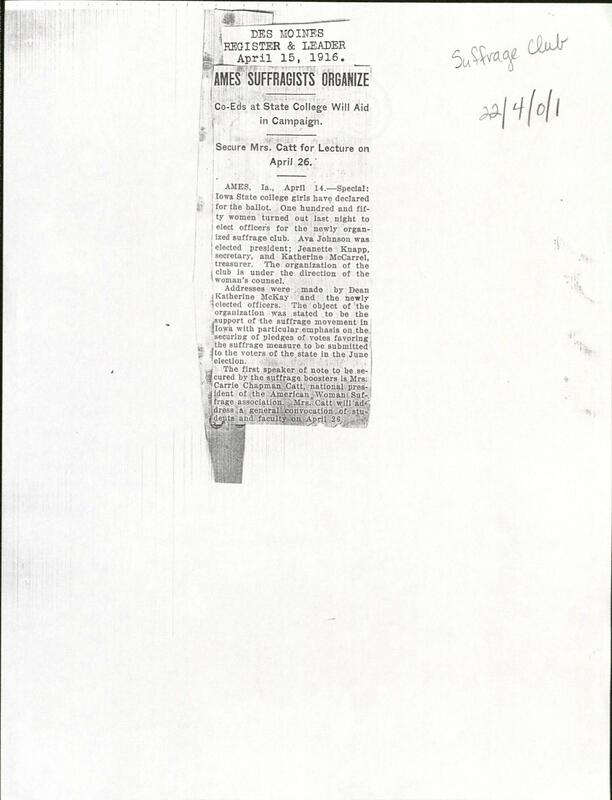 Newspaper clipping featuring the only known mention in the archives of the ISU Suffrage Club. RS# 22/04/00/01. If you are a part of an Iowa State club or organization and have documents (any inactive records, meeting minutes, photographs, etc.) pertaining to the club, then please bring them to Special Collections on the fourth floor of Parks Library. Those records can be stored for future generations to have a better understanding of your club. 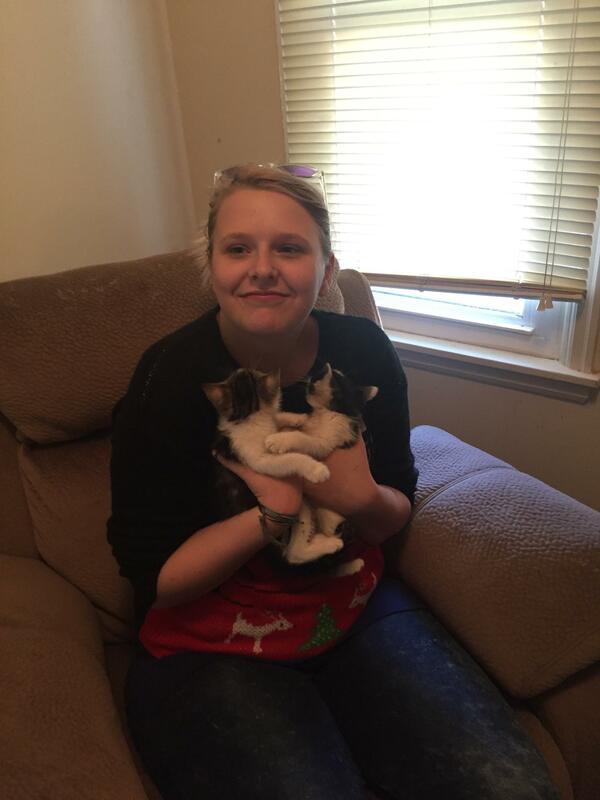 Amanda Larsen is in her third year at ISU with a triple major in criminal justice, psychology, and history. She has already proven herself to be a hard worker and innovative researcher, and SCUA is looking forward to watching her project unfold. She hopes that you have enjoyed the post! Leave a comment July 27, 2018 Rachael A.
Tornadoes have always played a major role in Iowan life, as those still reeling from the images of last week’s destruction realize all too well. In fact, as one might guess from the nickname “Cyclones,” this aspect of life is something the area is known for. SCUA has not, at least in the past, actively collected documentation of any major storms, but evidence of their ongoing existence has crept in here and there nonetheless. Below is a rare original page of Frank Leslie’s Illustrated Newspaper housed in Special Collections. 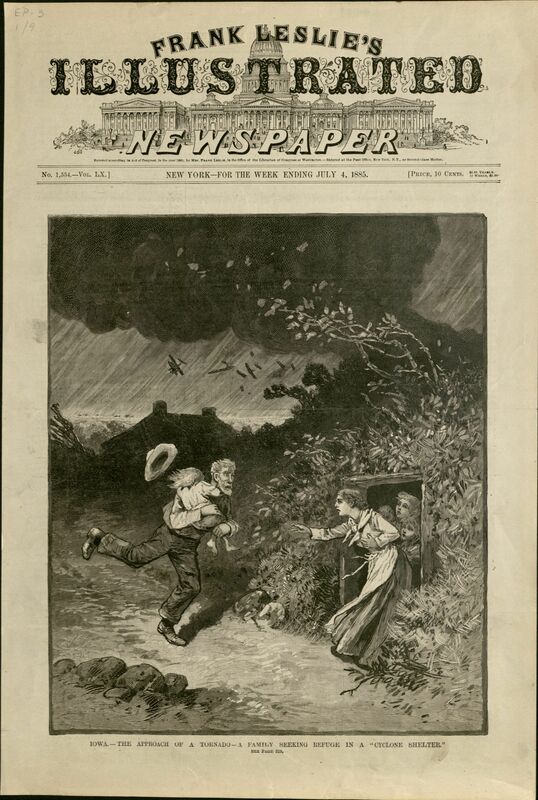 Also known as Leslie’s Weekly, the paper — based in New York — was famous for depicting scenes from breaking news via wood block engravings in an era before photographs were commonplace. For folks who like more tangible evidence of the past, you should check out the “tornado souvenir,” a hand-carved piece of birch bark from a storm on campus in 1924, which is held in our artifact collection. See more pictures here. Piece of birch bark with lettering (by hand): “Tornado Souvenir June 28, 1924[.] From Tree near Margaret Hall I.S.C. Ames, Iowa” (Artifact #2001-024). Photograph by Rachel Seale. It’s a bit further away from home geographically, but you can also glimpse damage wrought by an earlier storm (circa 1890-1910, though the image itself is undated) in Grand Mound, Iowa if you visit SCUA’s Flickr page, where we have a lot of other cool pictures, as well. You will need to click through to the link to see it, but this particular image was scanned from a glass plate negative, which can be found in the Descartes Pascal Papers, MS 91, Box 6, Folder 8. Because tornado damage is an ongoing reality in this part of the country, Iowans have cultivated a lifestyle of helping neighbors re-build and recover from these periodic disasters. And ISU students have been no exception, as all current members of the Cyclone football team demonstrated by donating their time last Saturday to help with clean up in Marshalltown. Nor have our athletes been the only students historically inclined towards lending a hand. 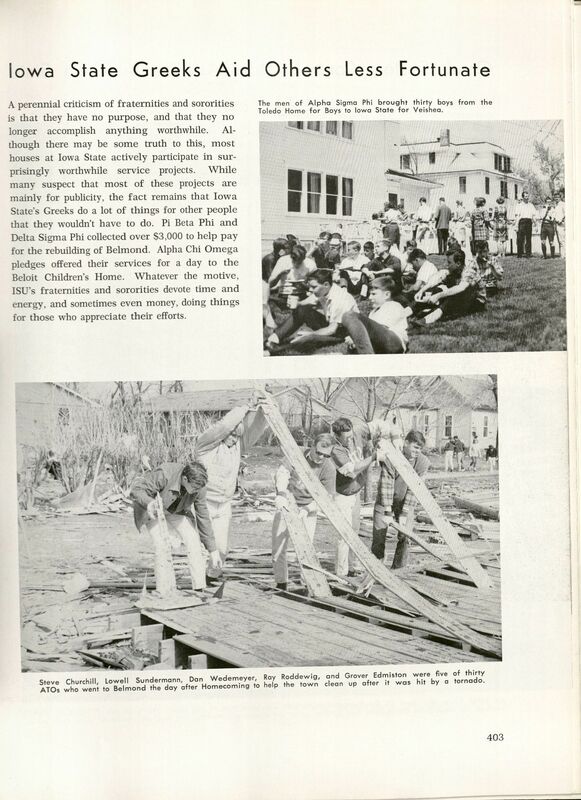 The 1967 Bomb article below evidences that multiple Greek organizations provided monetary donations and were well-represented on site after a tornado struck Belmond, IA in October 1966, even if the author of the article presents a rather biased interpretation of their motives. Best wishes, then, from SCUA for a speedy recovery to everyone who got caught in one of the most recent storms. And for those of you who are newer to campus, or to the state, don’t forget to check out the University severe weather protocols and/or some safety tips from ISU Environmental Health and Safety. Leave a comment May 22, 2018 Rachael A. Note: It is unclear whether Dr. Kao is still alive (I suspect he is), but I have chosen to refer to him and his accomplishments in the past tense, as he seems to have moved on from his position at ISU some time ago. It is therefore this period of affiliation that I am referring to in past tense, and not Dr. Kao himself. Even without having met the man personally, I can say it would be difficult to describe Dr. David Teh-Yu Kao as anything less than an absolute credit to Iowa State University, where he served as the Dean of the College of Engineering from 1988 through 1994, and then as the Glenn Murphy Professor of Engineering from 1994 to approximately 1997. He is currently listed as a Professor Emeritus on the department’s website. I have not been able to verify that Dr. Kao was for certain the first Asian American dean of this college, let alone the first first-generation immigrant to hold the position, but the resources I have examined suggest that both are probable. Regardless of these distinctions, his influence left an enduring impact on the College of Engineering, and his leadership style speaks of a visionary with many diverse talents. Long before his time at ISU, Dr. Kao had distinguished himself as a gifted engineer. He earned his B.S. in civil engineering from National Cheng-Kung University, Tainan, Republic of China, Taiwan, in 1959. He then went on to receive his M.S. in civil engineering from Duke University in 1965, and his Ph.D. in civil engineering from the same institution in 1967. His research specializations included hydraulics and fluid mechanics, hydraulic transport of solids, and hydraulic machinery. For his work in these areas, Science Digest named him one of the Top 100 Innovators of 1985. Contrary to stereotypes about folks gifted in STEM fields, however, Dr. Kao also seems to have been naturally out-going, very much a people-oriented person, and consequently a talented and attentive teacher. In his previous positions at University of Kentucky, he won the Outstanding Teacher Award in the Kentucky college of Engineering three times and the R. E. Shaver Award for Excellent Teaching twice, in addition to receiving the Western Electric Fund Award for Excellence in Instruction of Engineering Students and the Great Teacher Award of the University of Kentucky Alumni Association. In his position as Dean of the College of Engineering at ISU, Dr. Kao also earned a reputation for having a uniquely philosophical approach to outreach and problem-solving. Among his many accomplishments during his 5 and a half years as dean, Dr. Kao lead the development of the College of Engineering’s first strategic plan, doubled student scholarship funds ($224,000 in 1987 to $430,000 in 1994), quadrupled private donations ($2 million in 1988-89 to $9 million in 1991-92), and advocated for the Women in Science and Engineering program. While it is nowhere explicitly linked to his efforts, it is also interesting to note that SCUA’s Archives of Women in Science and Engineering was established during his final year as dean. He also advocated for more balance in faculty teaching and research development, innovative teaching methodologies (which, at the time, meant an emphasis on collaborative learning), and established outreach programs that reached children as young as kindergarten. In short, ISU is a better place for Dr. Kao’s having worked here. We are immensely privileged to have benefited from his talents.